Within the Ozark Mountains and surrounded by Norfork and Bull Shoals lakes, and the White and North Fork Rivers, Mountain Home was one of the state's first water resort and retirement regions with fishing, water sports, outdoor recreation, shopping and dining as top draws. Also, golfing, historic attractions, and natural beauty lure visitors to the area. Bull Shoals-White River State Park, just below Bull Shoals Dam, offers 105 campsites along the trout stream, picnic areas, pavilions, playgrounds, trails and a full-service dock. The park also schedules events, nature programs, and tours throughout the year. Fishing resorts are located along the White River for several miles downstream from the massive dam. Another famous stream, the Buffalo National River, flows into the White just a few miles south of Mountain Home. Canoeing is the top activity, but camping, hiking and warm-water fishing are also popular. Located in north-central Arkansas, Mountain Home is 52 miles from Harrison and 129 miles from Fayetteville. 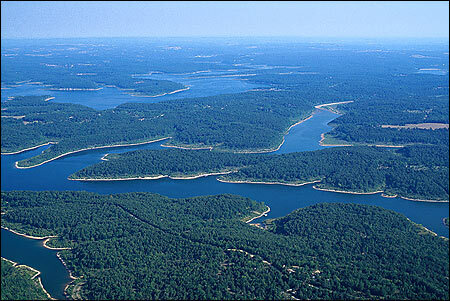 Granddaddy of all the big Ozark lakes. A 550-mile shoreline offers a wide choice of resort accommodations and the action is non-stop for bass, walleye, stripers and panfish; scuba diving; 12 Corps of Engineers campgrounds; boating, skiing, swimming.